Trump, Syria "should we stay or should we go"
...Washington (CNN)President Donald Trump has told his national security team that he is willing to keep American forces in Syria in the short-term, but made it known he wants US troops to exit soon in a meeting on Tuesday, a senior administration official told CNN. Trump has said publicly that he's ready to withdraw troops from Syria, but his top military commanders have argued the battle against ISIS is not yet complete. "The military mission to eradicate ISIS in Syria is coming to a rapid end, with ISIS being almost completely destroyed," a statement from White House press secretary Sarah Sanders said on Wednesday. "The United States and our partners remain committed to eliminating the small ISIS presence in Syria that our forces have not already eradicated. US president's decision comes a day after saying he wanted to pull American troops out, arguing that the United States had essentially already won the battle against ISIS. Donald Trump has agreed to keep US troops in Syria, for the time being at least, a day after he said he wants them out. The US president is said to have changed his mind after meeting with national security advisers. Al Jazeera's Kimberly Halkett reports from the White House. Again can someone please please me when Asad ASKED us to put troops in SYRIA. how is it that we can just roll into someones country start killing people and decide when we come and go without the consent of the legitimate leadership? But OK 2000+ U.S. troops are "needed" to destroy ISIS ...now..., really? No one else? maybe the Syrian army the Russian army had something to do with killing them over the pass few years? the questions framed around the Syria question make assumptions that are crazy and illegal. What should the troops be doing? What? We should have never have had troops there in the 1st place. the Us to Syria" "...If we stay there will be troubllle, If we go there will be doubllle..."
Going into Iraq CREATED Isis. it was stupid to go in. Yes it was. And do you really think that OUR 2000 troops are what got rid of ISIS in Syria so far? supposedly they didn't get there until last year anyway. Seems to me that the Syrian Army, the Russians and the Kurds have done job so far, SOMEHOW i think they can get by without us to finish the job. Especially if the US ans US military doesn't fund or train anymore "rebels"/ISIS. And again... who invited our troops into Syria? why can't i get a strait answer to that? and who exactly authorized ground troops in Syria? did congress, did the U.N. or did the president simply unconstitutionally send them in? basically invaded the country taboot. the answer is clear, even though folks somehow want to imagine excuses why the U.S. military HAS TO be wherever it is in the world. people want to put troops on our boarder and call folks that walk across looking for a job "invaders" what does that make 2000+ uninvited US troops who cross into Syria without passports or proper Syrian gov't authorization? 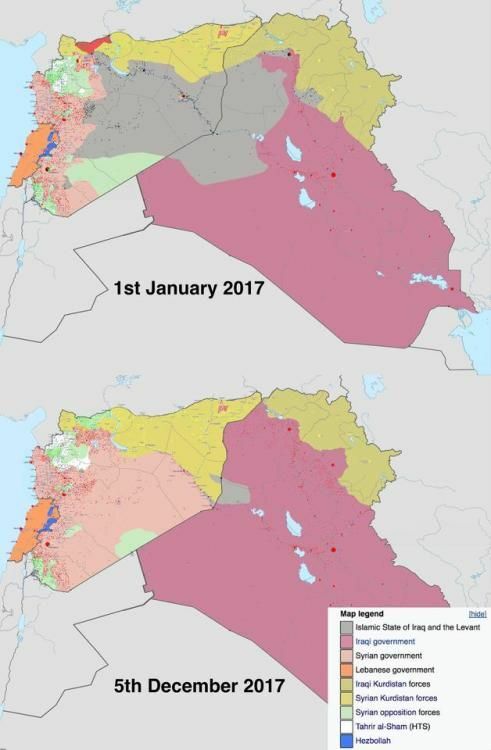 MAP of where ISIS loss of ground even last year. ISIS or ISIL has existed since 1999.
so which deployment to iraq created them?